Scattered throughout the fairgrounds are 189 camping and RV sites that offer conveniences for comfort such as water, showers, electricity, telephone and cable service. There are 92 sites in the first area and 97 paved sites, open year-round, in the second area. 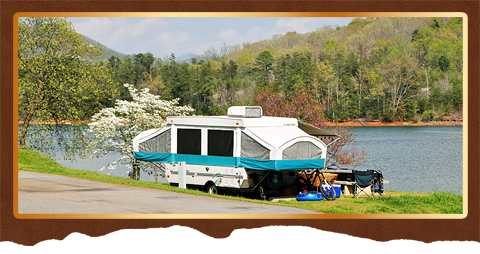 Most sites offer beautiful views of Lake Chatuge, and campers can take advantage of the fairgrounds’ many amenities including two playgrounds, a boat ramp, two tennis courts, paved playing courts, shaded picnic tables and the Hamilton Rhododendron Gardens.